I stepped out to fetch the morning newspaper from the driveway yesterday morning, and noticed this on my way back in. I thought he was dead and lifted him by the strand of spider's web that was holding him up to throw him in the trash. But as I broke the strand, he scampered away. I caught him again and tried to remove as much of the strand as I could, but couldn't do too much as he struggled and I let him run off. I wonder how long the poor fellow had been stuck there. 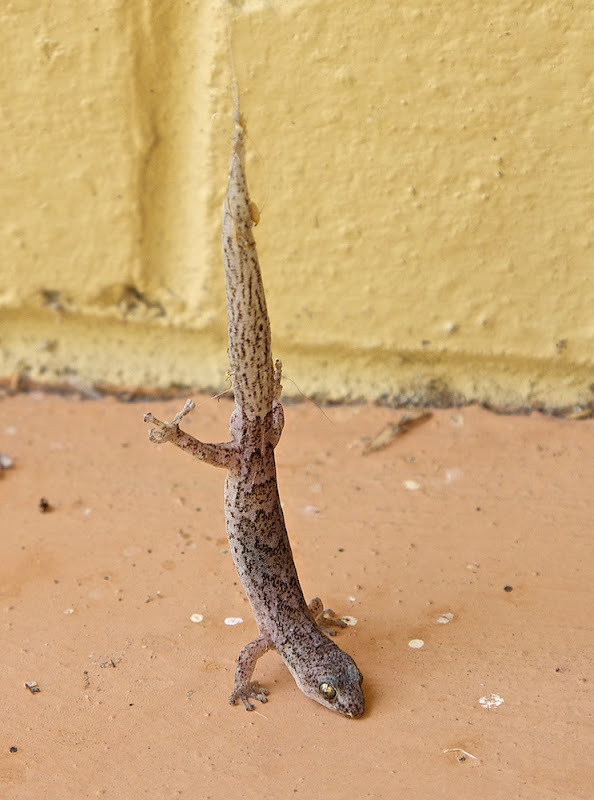 Master Gekko is more like doing the handstand, if not the headstand. Thanks for the info on webs. Who would have thought such a humble mundane thing could have such properties? You have those there? My brother in Auckland married a kiwi, a New Zealander...and when he brought her home on holiday, those things scared the living daylights out of her. She would shriek hysterically, "Chi...chak! Chi...chak!!!" Those were the small ones... LOL!!! Yes we do have a variety of these lizards. Unlike the chichak, they don't come into the house. I remember in my childhood days, the chichak would congregate round a fluorescent tube and catch insects.